Jaipur (Rajasthan) [India], Apr 17 (ANI): Yoga Guru Baba Ramdev on Wednesday said there is currently no other leader in the country who can match up to the stature of Prime Minister Narendra Modi and anti-national powers are using foreign funding to prevent him from returning to power. 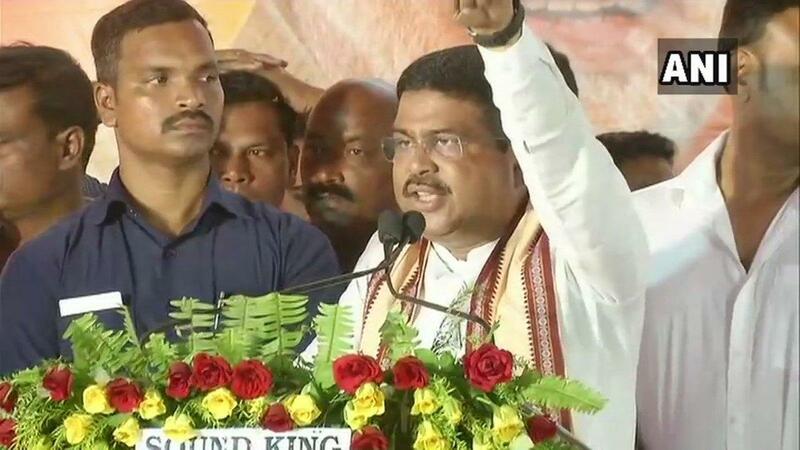 Cuttack (Odisha) [India], Apr 13 (ANI): Union Petroleum Minister Dharmendra Pradhan on Saturday said that the Bharatiya Janata Party (BJP) would provide essential food articles at the price of rupee one under the National Food Security Scheme if voted to power in the state. Cooch Behar (West Bengal) [India], Apr 8 (ANI): West Bengal Chief Minister Mamata Banerjee on Monday accused Prime Minister Narendra Modi of not sanctioning any funds for the development of the state. Thane (Maharashtra) [India], Apr 7 (ANI): A woman delivered a baby boy at Thane railway station on Saturday evening after she developed labour pain while travelling to Kurla. Hyderabad (Telangana) [India], March 31 (ANI): Alleging that Congress is demanding crores of rupees for its tickets, former AICC secretary and its incumbent member P Sudhakar Reddy on Sunday resigned from the party after writing a letter to Congress president Rahul Gandhi. Mumbai (Maharashtra) [India], Feb 21 (ANI): Equity benchmark indices jumped between gains and losses in the morning session on Thursday with banking stocks showing some gains. New Delhi, Feb 10 (ANI): A quarterly survey by industry body FICCI portrays a better outlook for the manufacturing sector with 54 per cent of respondents reporting higher production from October to December quarter of 2018-19 compared to 47 in the same quarter of the previous year. The curious case of "accidental" one rupee note! New Delhi [India], Jan 13 (ANI): Following the release of his latest film, 'The Accidental Prime Minister', Anupam Kher shared a video showcasing an interesting story of an "accidental" one rupee note. New Delhi [India] Jan 12 (ANI): Fuel prices continued to rise for the fourth consecutive day, as the Indian Oil Corporation announced a fresh revision of prices on Saturday. New Delhi [India], Dec 31 (ANI): The price of Non-Subsidised LPG in Delhi will be decreased by Rs.120.50 per cylinder from January 1, due to fall in the price of the domestic cooking gas in international market and strengthening of US dollar-rupee exchange rate. New Delhi [India], Dec 11 (ANI): The markets on Tuesday witnessed a gap-down start ahead of the results of the state elections, and investors turning wary over the shocking resignation by the Reserve Bank of India (RBI) Governor Urjit Patel. New Delhi [India], Dec 10 (ANI): A day ahead of assembly poll results, the markets on Monday plunged over a per cent in the morning trade, with Nifty opening above 10,550.